It’s that time of year again… Everywhere you look there is sweet treats to be had or you yourself are about to start some holiday baking. Well, I am here to help. 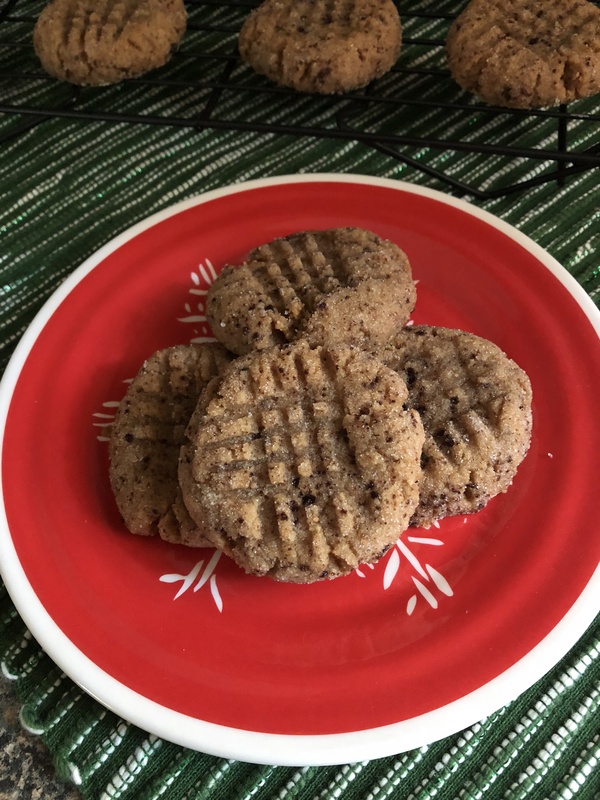 It’s my 3rd annual Cookie Palooza and I am kicking it off with Peanut Butter Espresso Cookies. Before you make a face or think I am a little nutty (some pun intended with that one) I will say don’t knock the flavor combination until you try it. It’s actually quite good and the coffee flavor becomes more pronounced – but not in a bad way – by the second day. And if you’re planning on leaving cookies out for Santa these may help him get the jolt of caffeine he needs to deliver all those toys (or for you to put together those impossible toys you just don’t want to deal with on Christmas morning and would rather have assembled and ready to go with a bow on the under the tree). What’s really nice about these cookies that the recipe only requires one bowl (less clean-up is always a good thing) to come together. No mixing flour and spices in a separate bowl as these cookies are gluten free. So, those of you who have a gluten allergy can partake in your holiday cookie indulgence without worry. 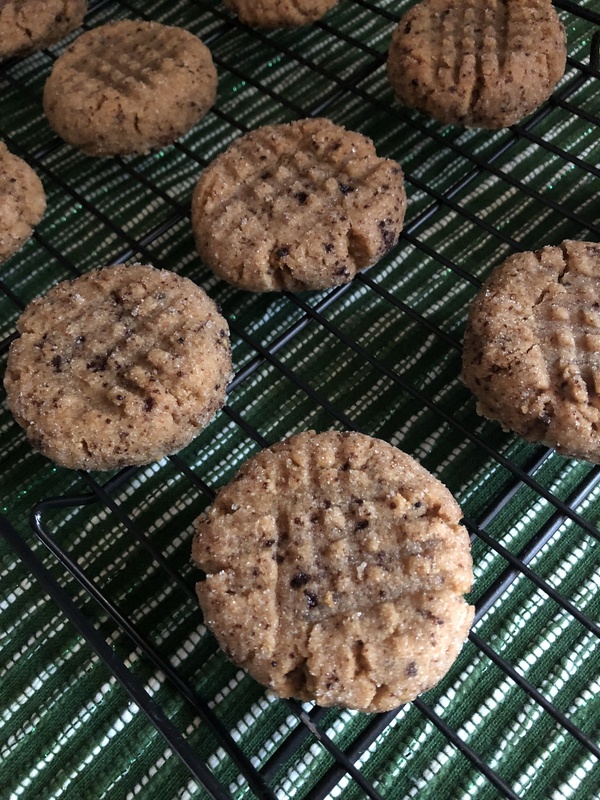 The key to these cookies is natural peanut butter. The exact amount is 16 oz. and thankfully that’s an easy sized jar to find at your local supermarket, I used Smucker’s branch. Make sure you read the label on the brand you buy. The first brand I picked up said peanut butter spread and it was labeled as natural peanut butter. Peanut butter spread is not the same as actual peanut butter. It actually contains about 30% less peanuts and that difference can be supplemented with Trans fats that are not healthy. Natural peanut butter separates so when you open the jar there will be a layer of oil on top. Don’t be concerned with mixing the peanut butter to incorporate the oil. Just pour it into the bowl you’re using to make the dough along with the peanut butter and the remaining ingredients and the oil will incorporate as you mix all of your ingredients together. This is exactly what I did. After making the dough, I then used a cookie scoop to scoop the dough and shaped it into balls that I then rolled in a sugar espresso coating. And for that traditional peanut butter cookie look I flattened the cookies with a crisscross pattern using the tines of a ford. I baked them for 11 minutes in a 350 F preheated oven and then let them cool on the baking sheet for a few minutes before transferring them to a wire rack to cool completely. Definitely allow them to cool for a few minutes before transferring them so the cookies can set. If you transfer them too quickly the cookies will break, you’ll still have delicious cookies, but, they will be more like cookies pieces. Preheat the oven to 350 F. Line two baking sheets with parchment paper and set aside. In a large bowl combine the peanut butter, brown sugar, and sugar and stir with a rubber spatula until combined. Add the eggs, vanilla, salts and espresso powder and continue stirring with the rubber spatula until all of the ingredients are incorporated. In a small combine the ingredients for the coating. Using a cookie scoop to scoop the dough and then shape into balls. Rolls the cookies in the sugar-espresso mixture and then transfer to the prepared baking sheets. Place the cookies about 2 inches apart. Using the tines of a fork, flatten each cookie creating a crisscross pattern. Bake in the preheated oven for 10 to 12 minutes. Let cool on the pan for a few minutes before transferring to a wire rack to cool completed.